Have you been looking for true love in a teacup? Then you’re sure to fall ‘head over heels’ for the Valentine’s tea. It deliciously combines the luxurious flavor of fresh-dipped chocolate-covered strawberries with the taste of premium Ceylon black tea. Don’t wait until February to treat yourself to this romantic tea, give it a try today. Adagio Teas has become one of the most popular destinations for tea online. Its products are available online at www.adagio.com and in many gourmet and health food stores. Just received my package with a little over $50 dollars in samples from Adagio, so I have lots of new teas to try out in the next few weeks. Yay! This was the first one I picked out of the bunch to smell, and now the first one I’m actually steeping. The smell is exactly like chocolate covered strawberries, no mistaking it. Not strawberries plus chocolate, fighting with each other, but specifically chocolate covered strawberries. The first few sips of this, I was unimpressed…typical Adagio ceylon base with that dull bitterness it always seems to have. I wasn’t sure how strong the chocolate-strawberry flavor was going to be, after reading *Ricky*’s review (and others), but I could actually taste them quite strongly. Anyway, at first it seemed average, like nothing special. I added a little milk and Splenda, and it was still average. But all of a sudden, I had finished my cup and I wanted more. I actually was craving more! I get bored with tea flavors easily, so that rarely happens. Perhaps the bitterness left on my tongue from the first few sips faded away. Whatever it was, this is good, and a little on the boring side, but I’m glad I tried it. Editing to add, second steep isn’t worth the effort. That’s a lot of samples! Hah, you THINK they’re small amounts.. until you have hundreds of them and they’re taking over your kitchen..
Valentine’s is definitely my favorite Adagio flavored black. I, too, loathe their Ceylon base, but Valentine’s manages to overcome that beautifully. Shanti, it takes a lot to get me bored. but since I resteep it’s always good to get a tea that morphs over time. I have yet to try this flavored tea and keep hearing how good it is. Odd that I have never picked up a sample of this considering I have their sampler tins all over my house. @jennlea If you’re interested in a swap, I have a 4oz size of it, so I can part with some. @Bethany oooo, will send you a message! What were your steep times for this? I’ve been hesitant about trying this again after my first go with it. I think I might try this again with a three minute steep, but I’ve honestly never been fond of Adagio’s flavored black teas. You know, I’m kind of getting a cardboard-y taste from this now…I think all of the blacks I’ve tried from Adagio (decaf and non-decaf) have that same weird taste as well. Disappointment. Ricky, I’m not sure what time I steeped this for, since I used my handy but mysterious Zarafina this time. BTW I bought $50 worth, not 50 samples. But yeah, I still have like 250 cups left! LOL! Yeah…they are good for 6-12 infusions depending on your strength preference and size of leaf. You’ll have fun with them!!! You’ll get more cups from black and green than white and pu erh cuz they require less leaf. Ricky, no- most of the samples are $2, but some are $5. Once upon a time, Ninavampi didn’t know much about tea. She wondered around trying things that sounded tasty, mostly super sweetened to help her get through studying. This tea in particular was a tasty favorite. NInavampi prepared it dark and sweetened and sipped away at it through the night in a dorm room with her roommate and today, best friend. Time has passed and Ninavampi got a job and refined her tastes in tea. Sadly, for a long while she forgot about this tea. Now, on a tea-intense weekend, Valentines has been revisited by NInavampi. Ninavampi still thinks that it is delicious. Ok… Enough with the third person narration… hahaha… Sorry! Seriously, sweetened, this tea is delicious. It may taste a wee bit artificial, and in my opinion not entirely like chocolate covered strawberries, but it is really tasty. Dry, it smells sweet and a lot like a strawberry Tootsie Roll pop. Once it is brewed, a bit of the chocolate smell peaks out. I don’t get much strawberry. Sweetened there is a vague strawberry-chocolate flavor that is much like trying to remember a dream. The more you think about it, the less you can place it. Even though I don’t feel like Adagio’s description of it is 100% accurate, there is something overall pleasant in this tea. It has the ability to smoothly coat your mouth and leave you wanting more. I had to brew two cups of this today before I had satisfied my sweet tooth. This is really worth a try. I don’t think it is a tea for everyone, but for those of us who like to indulge in something sweetened once in a while, this is a scrumptious treat. I just wanted to say that I was enjoying that third-person narration at the beginning. It made me grin. : ) Thanks for letting me know MegWesley! It made me smile! Very cute post, a Sunday afternoon that includes sweet tea and a girl’s best friend, could it be any better?! I reelly liked your story! …and they sipped happily ever after. Yesterday was a very nice, laid back Wednesday. I didn’t have any homework after I finished my online stuff that was due for this week, so I sat back, watched some Netflix and Food Network (my favorite channel for anyone who was wondering! ), read, and enjoyed some nice, simple tea. I wasn’t in the mood for anything too complex or difficult, so it was a simple flavored black tea kinda day-one where I could just put the water on, wait until it boiled, steep, and enjoy! This one was sent to me by Amanda along with a host of other teas that I have yet to review because I’m lazy! Don’t worry, those who have swapped with me! I have got your stuff and it will be reviewed! :P Anyways, last time I drank this I wrote that there was something funky tasting about the chocolate and I think that I’ve discovered what it is-it tastes like hazelnut coffee! Which I mean, that’s okay because I happen to like hazelnut coffee, but I won’t raise the rating on this one because it’s not supposed to taste like hazelnut coffee, it’s supposed to taste like chocolate covered strawberry. I do get a little bit of juice from the strawberry but it’s not really as strong of a flavor as I’d like. I have yet to find a chocolate covered strawberry tea that I like (I believe I said that last time I reviewed this one, too). When I think of chocolate covered strawberries, I think of a really sweet and juicy strawberry that you bite into and you get the sweetness and then the chocolate is kind of a background creamy, sweet kinda note. Anyone get what I’m sayin’? I just think that strawberry is supposed to be the main flavor and so far (I’ve tried three! ), all of the teas I’ve had of this flavor have had chocolate be the main note! Oh well, I’ll have to keep trying! @Yogini-I love chocolate covered fruit! I hate chocolate but for some reason when it’s on fruit I absolutely love it! Interestingly, given the amount of points I decided to give this one, I seem to be racing through the sample TeaEqualsBliss gave me. Adagio sample tin sized sample that is. I can usually make those last a good while. I’ve had this one three times already, four with this one, and I think the reason I’m going through it so quickly is because of how nommy it was that second time when I managed to bring out the strawberries. Not sure how I did that. Maybe it was a temperature thing? (Temperature! The bane of my existance!) Not owning a thermometer I had to get a little creative. Luckily the http://steep.it site has proven helpful here. No clue what the temperature is, but I can standardise it somehow by boiling a set amount of water and then timing how long I wait before using it after it has been brought to a boil. 1 liter, 2 minutes wait. So did it work? Were there strawberries? Hard to say, actually. You see, I just ate some lemon pudding… My tastebuds are all screwed up now. Can’t really tell what it tastes like at this point. After half a cup, tongue is getting back to normal, and I can tell you that no it did not. Maybe it’s steep time and not temperature that’s important here? What I’ve got here tastes mainly just like a standard black with some undetermined flavouring in it. Super-boring. On the second half of the pot, it’s gained a bit of a bite of over-steepedness. It’s just a bit though and something that could be strawberry-y if you sort of squint has come out. Only… now there’s no chocolate to be found. At all. Anywhere. I love the part about bringing out the strawberries. I am starting to realize that part of the enjoyment of tea is that it is a participatory sport and there’s such a feeling of victory when it works the way it’s supposed to! steep.it is really helpful. Hopefully we’ll be able to incorporate something similar on Steepster soon. There are a ton of awesome possibilities with giving recommended times/temps and such. This is one of those teas that seem to taste different each time I try it! I drank it with some skim milk this time which seems to be a good way to go for all of Adagio’s flavoured black teas as it tones down the (rather harsh IMO) Ceylon base Adagio uses and lets the other flavours come out. From what I can taste, chocolate is still the dominant flavour of this tea, but I’m getting the fruity notes better than when I drank this tea plain. There’s also a hint of floral rose which I couldn’t taste before. I still wish the strawberry flavour were stronger, but I’ve noticed that even Adagio’s plain Strawberry tea is quite weak as well, so it might be a question of quality as opposed to amount in this blend. There is definitely a little rose in this (idk if I read it on the website, just saw it in the tin, or was told it)- but it definitely needs more IMO. Do you think an extra min and a half would be adventageous? More leaf? I love adding milk/creamer to chocolate teas, but I can’t do it w/ this one. I don’t like strawberry milk lol. I chatted for an hour (or more) with my SororiTEA Sista tonight! :) Thanks for the chat, Anne! SIPDOWN ALERT!!!! It’s gone from my stash!!! I am certain that the extra strawberry pieces I ladled into my cup, coupled with the “real fruit juice” in the box of Sunkist Fruit Gems my husband got me for Valentines’ Day, constitute a nutritious breakfast. Absolutely love the aroma! That’s the saving grace of this tea. Open the tin and you get hit in the face with chocolate (not literally). Some people probably wouldn’t like that but I do. But after that amazing nose, I only get slight hints of those flavors in the liquid. There’s a slight maltiness, but I don’t get strawberries. Maybe a bit of sweetness for strawberries…but I think that’s stretching. Oh, and since situational drinking descriptions seem to be the trend now…I’m sitting in my apartment working on Steepster listening to 3Oh!3 (also from Boulder). Fatty (cat) is sleeping on the couch and Dexter (dog) is sleeping in his bed – real lively bunch. Anyways, I’m really doubting my tea drinking skillz…where my Steeps at? Try steeping it a little less…over 5 minutes – depending on amount of loose leaf – might be the case. Was it bitter at all? I should have mentioned how much tea I used in the review. I used about 2 1/2 heaping teaspoons for the pot, which is about 26 oz. Try doubling that. I usually use about one heaping tsp per 6 oz of water… it’s more than most companies recommend, but you can get an extra steep or two out of it anyway. I don’t know why, but the image of you crying on the couch squeaking out “WHERE MY STEEPS AT? !” while your dog and your cat stare at you and 3OH! 3 blares in the background is making me giggle madly. Could also be the fact that you’re wearing a Shredder costume. On a nearly unrelated note, does the lead singer of 3OH! 3 make anyone else feel like they’re listening to a Hellogoodbye song when Don’t Trust Me starts? That’s the only song of theirs I’m familiar with. Jason, try 2.25g for every 6oz steeped for exactly 5 min. takgoti, you crack me up. You’re my poster of the week, fo sho. I just had to say that. And I agree with the 33 observation. Except that Hellogoodbye is superior! P.S. Delirium is super strong, y0. @teaplz Aw, shucks. Thanks, friend! I like Hellogoodbye, too. Something about Two Weeks in Hawaii makes me feel like I’m in high school again. Strangely Weezer-esque for them. P.S. 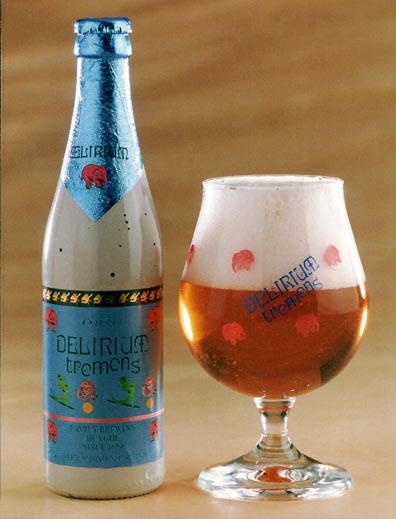 Delirium Tremens is the only beer that I can claim to actively enjoy. Being that I have the tolerance for alcohol of a fourth-grader, it takes a little more than half of one for me to start breaking out the WHOOOOOs! @jack: I’ll give that a try. @takgoti: That’s ridiculous. You’re being ridiculous. For one, I would NEVER sit on the couch and cry. I sit in my chair while working and do all of my crying there. Secondly, apparently I’m wearing a Shredder costume just because of my avatar?!?! That’s crazy! It’s friday, my costume is in the wash. I can’t work in it 5 days straight, that’s just gross! Mon-Thurs is the only reasonable limit. Stop being ridiculous. It’s the dog. His name is “Dexter Bebop”. I always wanted to get a dog and name them either Bebop or Rocksteady, but when it actually came time, Rocksteady was just so impractical and would probably just end up becoming Rocky or Rock. Casey Jones was mentioned at one point, along with basically every other turtle character. We did seriously consider Bebop though. But in the end he just looked more like a Dexter so we made Bebop his middle name. The cat’s name is Hermes, but he’s so fat we just call him Fatty (I didn’t name him, he’s my gf’s cat). Hey, a post with a setting is a post with character! :D Even better if you can throw some little background anecdotes in there as well. Um, that’s kind of awesome. TMNT was the only thing my brother and I could agree to play when we were little before we discovered Captain Planet and the big momma, X-Men. He was not down with the My Little Pony and I wasn’t a big fan of G.I. Joe. My only issue was that they always wanted me to be April and I wanted to be a turtle. So then they made me be Donatello because “He’s purple and you’re a girl.” Those were bitter, bitter years. A friend and I also once went through two entire rolls of quarters to beat the TMNT arcade game at Fuddruckers. @angrboda: Thanks for the little exploration in conversions, that’s awesome. So it looks like if I go with Cofftea’s recommendation, that would be a single teaspoon (slightly more than “a tiny little bit of top”) for every 6 oz of water. That’s really helpful, I appreciate you doing that! Will try. I read somewhere once that it’s generally a good idea to do that in order to dose tea correctly, but I’ve never got around to it before. Most of my teas are brewed by guess and learning by doing. I do not like. I’m thinking I need someone who’s purchased a bunch of Adagio teas to give me the heads up on a fairly popular one that enough people have loved haha. So far, while I haven’t hated the adagio teas that I’ve tried – they’re kinda of in the ‘meh" basket. As in, I’ll drink them if someone offered them to me but I wouldn’t spend my money there with all the other great options out there. Then again, maybe it’s just the black base that I’m not liking. I didn’t really taste the strawberries and the choclate was muted. I am sorry to say it and forgive me all Adagio lovers but yeah I soon learned Adagio is not that awesome. A few here and there yes pretty good but for the most part I had a hard time finding them and gave up. Some things aren’t bad, but the ones that are bad are REALLY BAD. It may also be that one of the first places i ordered from in terms of flavoured tea was Butiki haha Love the way they blend their flavours. Yeah, never ordered from Adagio, but it’s more hit or miss than DavidsTea, even, in terms of what I have tried. That’s fair. I’ve had a couple very bad Adagio experiences though, and at least all the DavidsTeas have been palatable (except the ones that are too floral for me, but some people like that).